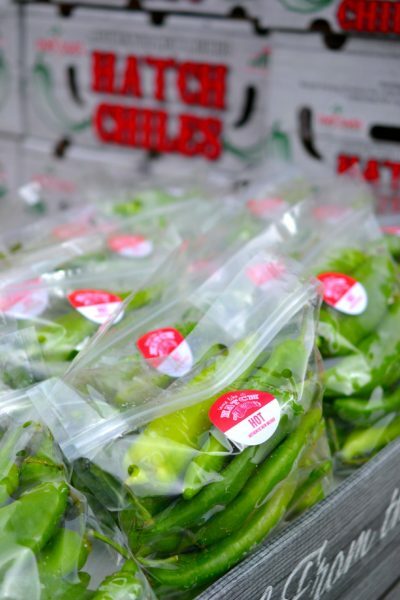 Hatch chiles – those fleshy, flavorful peppers that are most prized among chile connoisseurs – are back in season. While the season itself is short, now’s the time to start watching for Hatch chile products and events in your local grocery stores. 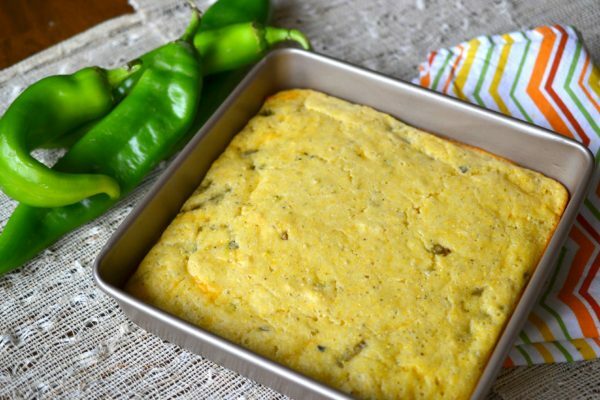 And if you manage to get your hands on some, you’re definitely going to want to make Hatch chile cornbread, which we’ll get to in a minute. Hatch chiles come in a variety of heat levels, and you can buy them fresh, roasted, dried, or in powder form. If you start with fresh Hatch chiles, you’ll want to roast them either on an open flame or under the broiler, rotating every two minutes or so, for a total of about 8 minutes. After that you’ll need to let them steam, either in a paper or plastic bag, or in a large pot with a lid. To prepare them, wear gloves (!) and gently peel off the charred skin, stem, and inner seeds and veins. You should be left with the perfectly roasted meaty flesh of the Hatch chile. 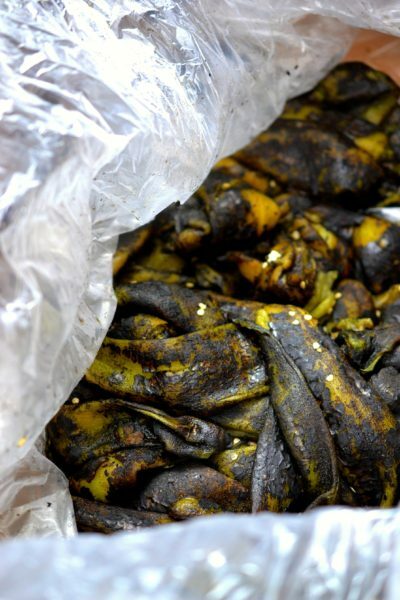 Roasted Hatch chiles are left to steam and cool off in a plastic bag until they are ready to peel. 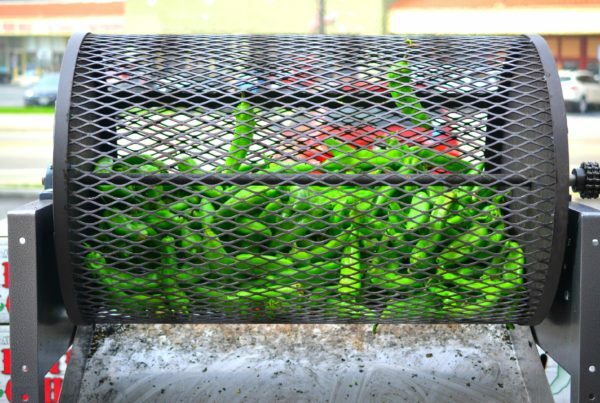 If this all seems too complicated, consider stopping by a local Hatch chile roasting event. At these popular events, usually held at supermarkets, you can watch the chiles get roasted in a giant industrial roaster, and you can sample and purchase a variety of Hatch chile products. 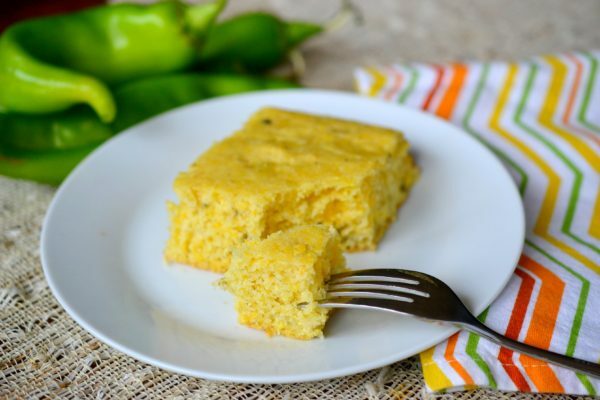 Now… on to the eatin’… When we took a look through the Melissa’s Hatch Chile Cookbook, the one recipe that the kids immediately latched on to was Hatch Chile Cornbread. This cornbread is sweet, smoky, and just slightly spicy – and it has the perfect amount of “heft” to pair with just about any main course. A sweet and smoky, slightly spicy cornbread that has enough "heft" to pair with just about any main dish. Preheat the oven to 400 degrees. Grease a square 9"x9"x1.5" or 8"x8"x2" baking pan. In a large bowl, whisk together the flour, cornmeal, sugar, baking powder, and salt. In a separate bowl, combine the eggs, milk, and oil. Add the egg mixture all at once to the flour mixture. Stir until just moistened (do not overmix). Fold in the cheese and the chiles. Pour the batter into the prepared pan and bake for 15 to 20 minutes, or until a wooden toothpick inserted in the center comes out clean. Let the cornbread cool slightly before cutting it into wedges or squares. Serve warm. While we visited a Hatch chile roasting, we also sampled Hatch chile salsa, BBQ ribs, chicken fajitas, tortillas, potato salad, guacamole, mac and cheese, chocolate chip cookies (yes, cookies!) and more. It seems that you can add Hatch chiles to just about anything and enjoy that spicy smoky flavor. For a few more Hatch chile recipes from Jolly Tomato, see Hatch Chile-Coriander Popcorn, “Hatched” Potatoes with Hatch Chiles, or Hatch Chile Pinwheels. Bonus to anyone who has read through this far: I have a Hatch Chile Cookbook to give away! Who wants it? 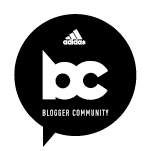 Leave me a note in the comments below and I’ll choose a random winner from the commenters. Blogger disclosure: Melissa’s gave me a cookbook and several Hatch chile products to sample. I purchased the rest of the products on my own because they were delicious. I did not receive compensation for this post. All opinions expressed are my own.